the thrift store library chairs. 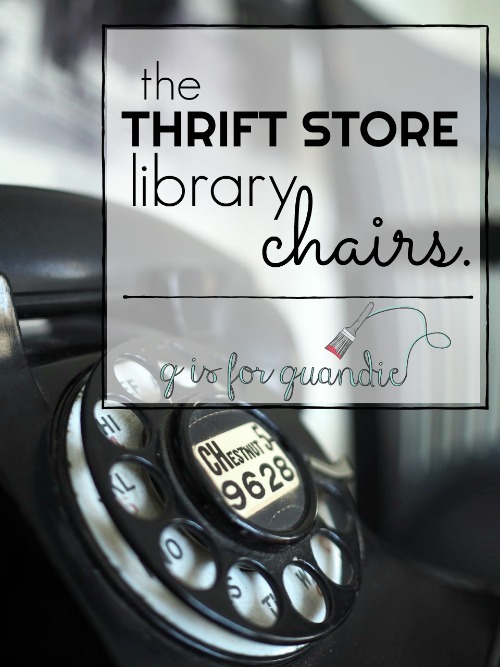 Remember the thrift store library chairs? My friend Meggan who was shopping with me when I purchased them suggested I paint them black, and several of you agreed. Mark this day down on your calendars, because it’s not often that I follow good advice. I ask for opinions all the time, but then usually go and do my own thing, often to my detriment (and I bet this annoys my friends to no end). But not this time. This time I gave it some thought and decided black would be perfect on these chairs. I started by sanding the chairs a bit and then wiping them down with TSP Substitute. Next I debated which paint to use. 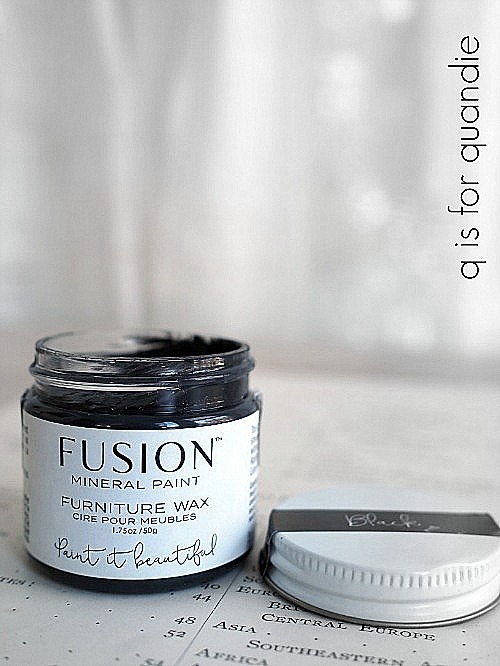 Milk paint, chalk paint or Fusion’s acrylic paint? 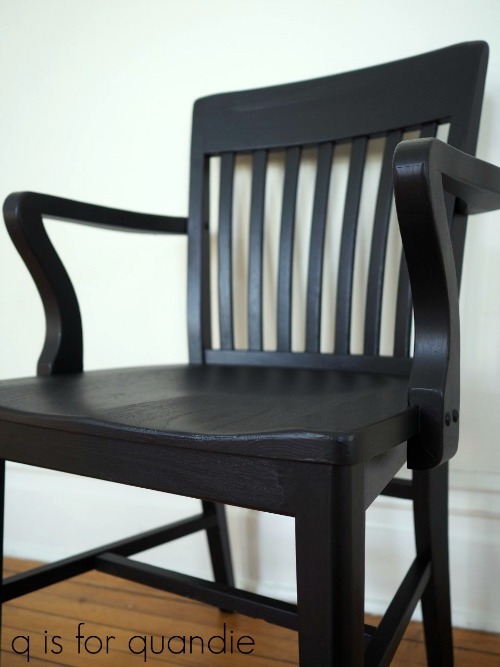 I love the look of hemp oiled black milk paint. 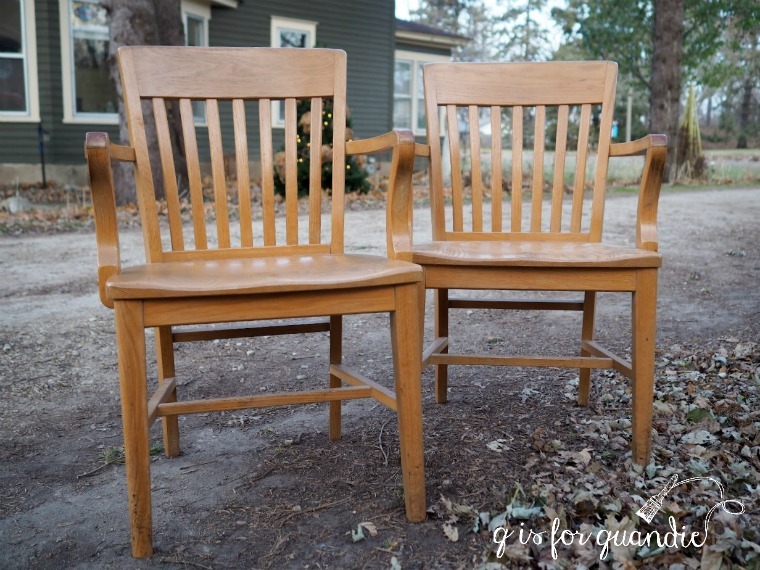 I definitely wanted a distressed look for the chairs, so milk paint would have been perfect for that. I even had plenty of black milk paint on hand (both Miss Mustard Seed’s Typewriter and Homestead House’s Coal Black). But the existing finish still had a bit of shine left to it so I knew it might possibly resist the paint a little too much. I could have solved that problem with a little extra pre-sanding but the chairs have all of those legs, slats and stretchers. So. Many. Surfaces. I just didn’t want to sand them all. Plus then there is the added work of applying a topcoat to the milk paint as well. Chalk paint was out for the same reason, and also because I didn’t happen to have any black chalk paint. So in the end I decided to go with Fusion’s Coal Black. Two coats of paint and done (well, not exactly as it turns out, but almost). Before I started painting I remembered some advice given by Sue at My Painted Door for making it easier to distress Fusion paint and decided to give it a try (read her post about distressing Fusion paint here for more details). This must have been an advice-following day for me! So, as Sue recommended, I added a little Homestead House Salad Bowl Finish (a.k.a. 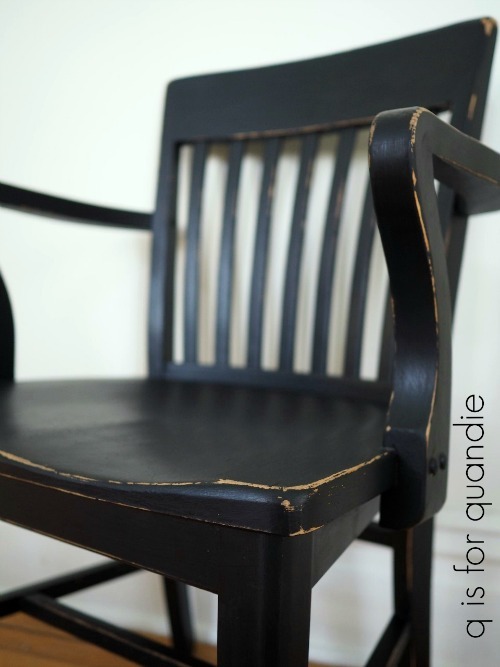 Miss Mustard Seed beeswax) to all of the areas of the chairs where the paint would naturally be worn away. Then I painted them with two coats of the Coal Black. Here is how they look before being distressed. I imagine some of you prefer this look (especially you Betty!). But I think distressing is what brings out the life in a piece. So I sanded the areas that had beeswax applied to them by hand with some 220 grit sandpaper and voila! And yes, it was much easier to distress the Fusion paint this way. Applying beeswax first in areas that you want to distress before painting with Fusion acrylic paint will make them much easier to distress. Even after the paint as cured for a few days. Although I haven’t tried it, I would assume this is true of other acrylic paints as well such as General Finishes Milk Paint (which is really an acrylic paint, not a true milk paint). Also, this is basically the same technique that I use to get perfect chipping when using milk paint. However, the acrylic paint doesn’t chip. It just becomes easier to sand away. Normally I don’t add a topcoat to my Fusion paint because it has a built in top coat and is very durable and washable on its own. However, in this case the bare wood in the distressed areas looked a bit fresh. Plus once you have sanded through to the bare wood, those areas are not protected. So I got out my Fusion black wax and added just a bit of it to the distressed areas to darken up and protect the freshly exposed wood. Although you are only seeing one chair in my photos, I do have a matched pair. However I think I’ll price them separately since some people might need just one chair, for a desk for example. If you are in need of a distressed black library chair (or two), be sure to check my ‘available for local sale’ page for more info. Handsome pair – black was a good choice for these. That black wax is an awesome tool. Must add love the vignette those black and tan suitcases are the bomb. Did you paint those as well? They are a handsome pair! And they already have a buyer. I did not paint those suitcases, they are in their original finishes. Did you notice that the one on the bottom of the pile is the same one I used in Monday’s post with the green dresser? I did not notice the bottom suitcase was the same one. I will have to back and check it out. You know, I’m not sure if that material is really leather. I think it’s some sort of paper product that they used on old suitcases that was intended to look like leather. And oh my yes, I’ve painted plenty of suitcases! 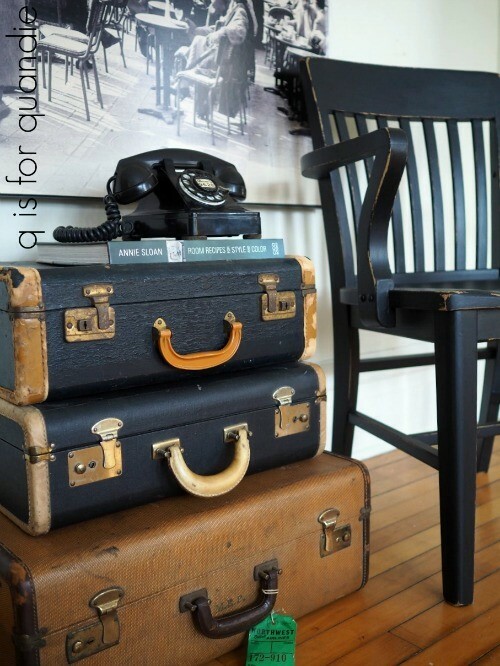 I’m more inclined to paint those hard sided suitcases, these black & white ones were some of my favorites! Stunning, coal black is a favourite I have used many times. No surprised someone has scooped them up! Black does continue to be a quick sell for me. I probably should paint more black than I do! The chairs turned out fantastic! I’m starting to notice a pattern here….the last two distressed, chippy pieces you painted seemed to sell right away. I also paint furniture….hmmmmm……maybe I need to stop being so fussy and start being more rustic and chippy? Always trying to figure out what the customers want! Good job, Quandie! Thanks Sandy! I almost always distress my pieces. The only exceptions are mid-century pieces, and sometimes I even distress those. There are so many pros to distressing; you really don’t have to worry about perfection, if the piece gets dinged up down the road it’s OK because it just blends in with the distressed finish, and I really feel like it brings out so much more character. 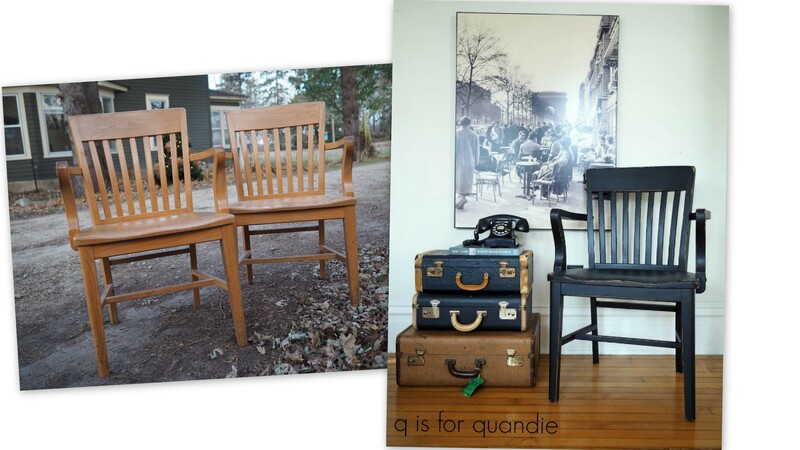 To me the library chair that I showed before it was distressed just looked positively blah. You could buy that chair anywhere. But after a little distressing it looks much more interesting, well loved, like it has some history. But of course, that’s just me. There are people who love distressed, and people who don’t. Maybe you should give it a try and see what happens! You give great advice Doctor! I thought perhaps you would have called dibs on the chairs before I even painted them Suzy! As for the Victrola, I’ve done three radio cabinet sort of pieces (here and here and here). Two of them were gutted and had shelves inside, and one of them I turned into a wine cabinet. Since yours works you are probably reluctant to gut it and re-purpose it, but it might benefit from a paint job if you’re going to keep it. If you really want to sell it, I think pieces sell better if they have a current purpose (not a lot of record playing people out there these days). Sadly, I feel like the market for antiques like your Victrola is pretty limited. Gosh…I gotta get up earlier! I checked too see what the chairs were going for and they were already sold! Great job on them…they look wonderful. I’m going to paint a similar one I have black… now that I’ve seen how great they look. I love the black chairs. I have used Fusion Paint on several pieces of furniture. I have tried several different types of brushes as well. I still get paint strokes which are hard to remove even when I sand between coats. 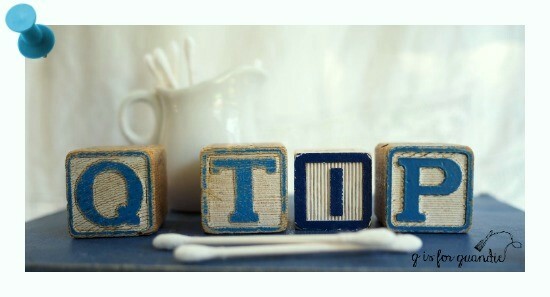 Any Qtips with using this type of paint? Some say don’t over work the paint, use less paint, add a little water, it must be your brush. How do you use this type of paint? I have read all of those pieces of advice as well Monica. But first, FYI, the Fusion people say don’t add water because it compromises the formulation of the paint. But they do recommend using a synthetic bristle brush if you want less brush strokes, or you can use a microfibre roller on larger surfaces, don’t over work the paint, make sure your stroke goes from end to end (don’t stop and start in the middle, you will see a mark where you stop and start), don’t press down too hard on your brush, keep it at an angle to your surface to avoid dragging the paint, and so on and so on. And I’m going to be honest with you here, I have tried all of these things except for the roller and although they have helped reduce brush strokes, I still get some brush strokes with this paint. I think part of the issue here is that we’ve all gotten so used to using chalk paint and milk paint. Milk paint is basically so thin that it goes on brush stroke free no matter what you do with it, and same with watered down chalk paint. 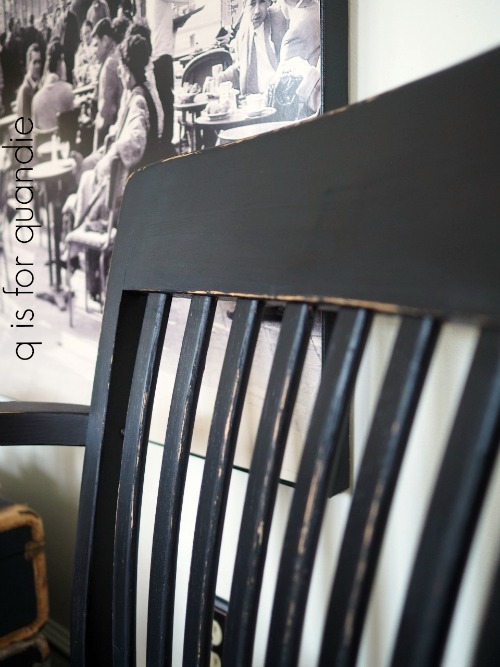 If your chalk paint is thick, you’ll get more brush strokes, but they can be sanded away quite easily. Once you add the acrylic component to the paint, it just simply doesn’t work the same way. I do find that the brush strokes are more noticeable with the darker paint colors, not so much with the lighter colors. And they are also more of a problem on large flat surface areas like a dresser or table top (maybe that roller would be a good choice here). I ended up with a lot of brush strokes on the queen size sleigh bed that I painted (here). My philosophy is simply that there is no one perfect paint product. There are pros and cons to all of them. Fusion is a great product in so many ways (no need for a topcoat, very durable, washable, affordable), but you may not get a perfectly smooth finish with it. I keep that in mind when selecting the paint I’m going to use for each project I work on. Plus, of course, there is also the fact that I think perfection is overrated. I have yet to be unable to sell a piece of furniture because it had too many brush strokes. That bed sold more quickly than most of my pieces! Thank you so much much fior the advice. I thought that it was just me. I have painted quite a few pieces with this paint and they all came out the same. I sanded between every coat and still brush strokes, not bad but still there.I guess that I expected it to act like milk paint or chalk paint. I will remember not to add water! Great look for these chairs. They are kinda manly, but very cool. I read your discussion above about the brush strokes and it has me re-thinking about my kitchen cabinets. I bought fusion paint for them, but I might have to go back to the big box stores canned paint so there are fewer brushstrokes since I picked a white. I’ll practice on some drawer fronts to see. Great job on the chairs, sold is a good thing! Here is a great blog post from Melanie at Lost & Found Decor about brush strokes with Fusion paint too. As for your cabinets, I feel like the white shows the least amount of brush strokes (it’s the dark colors where they tend to be more visible). In addition, I assume that each drawer front or cabinet front itself isn’t a big area, so you won’t have as much trouble with stopping and starting etc. My friend Terri just painted her kitchen cabinets with one of the Fusion whites and she absolutely loves how they turned out. And I can promise you that she was not overly careful about how she painted. Also, the real beauty of painting cabinets with Fusion is that they will be fully washable once cured. Definitely try the Fusion on a drawer front first and see what you think. Because if you like how it looks, I think the durability of Fusion makes it a great choice for cabinets! I love how they look painted black…great lines! 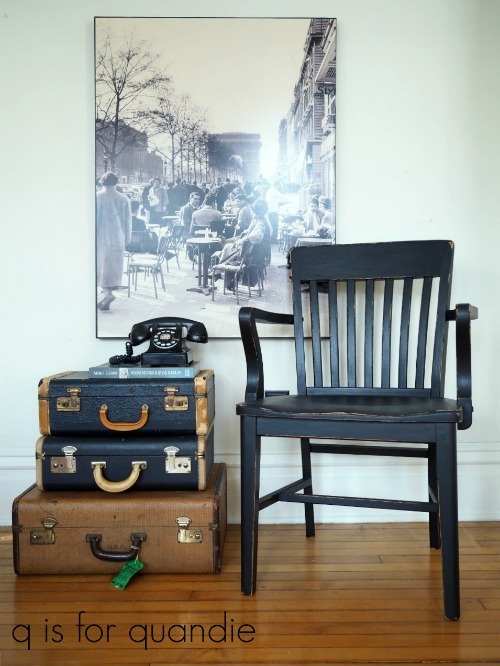 I love how you styled this chair! Is that a large Parisian photo? I don’t recall you using that before. Those type of chairs are really comfortable too. Love them in black! That is a large Parisian photo and usually it hangs in my bathroom. You can read more about it here. I’ve never thought to use it to stage photos before, but it came to mind when I was working with these chairs! Loving the chairs! And the distressing although they were very pretty before the distressing. Both ways looked great. Hi gal..those black chairs look great but you know me too well. Glad they went so quickly for you. I guess I only get stressed when I am too tired. LOL love to Mom and Sis. Just wondering how much you spent on the thrift store library chair. Love how they turned out with the black fusion paint! I think I paid around $12 each for the chairs. It was a bargain. Normally I see the chairs selling for much more.